The state asked systems engineers for advice on boosting reading proficiency. Arianne Weldon is referring to how just one-third of Georgia’s third-graders are reading proficiently. Weldon heads Get Georgia Reading, a statewide collaboration of more than 100 public and private partners designed to create the conditions necessary to get every child reading by 2020. Reading proficiency is also a national crisis. Nationally, two-thirds of children are reading below grade level in fourth grade. For low-income kids, the rate is an astounding 80 percent. For Latinos, it’s 81 percent, because these children are disproportionately more likely to be lower income and English-language learners. Weldon, an epidemiologist by trade, turned to an unlikely source for information on boosting reading levels: systems engineers. The Health and Humanitarian Systems Center at Georgia Tech is one of the most highly regarded in the country and has gained a reputation for offering innovative solutions to complex issues such as how to expand access to health care. Weldon wanted to expand access to quality reading instruction and opportunities. As an epidemiologist, she knew that just as looking at disease patterns offers clues about how to stop their spread, looking at reading patterns would offer clues about potential solutions. Several states, including Tennessee, Alabama, and Minnesota, recently attempted to address reading proficiency through teacher training, funding for early-childhood education, and other policies. Weldon’s team met several times with researchers at the Georgia Tech center over the past two years. They put together a framework to address the issue using the problem-solving and decision-making strategies engineers employ, looking at things such as barriers to access. Julie Swann, codirector of the HHS Center, thinks reading proficiency “is a problem everyone should care about,” and her engineering background let her examine it with a fresh eye. Her team looked at some of the root causes for why a child might not be reading, including school absences, access to preschool and libraries that offer ready access to books, and individual barriers, like speaking English as a second language. That makes sense. But then they went a step further. A kid might be absent more often if he doesn’t have regular access to good doctors, so helping that child read on-time might mean improving his access to healthcare. Right now, 28 percent of Georgia residents have a bachelor’s degree, slightly lower than the U.S. average, and at 18 percent, the poverty rate is 3 points higher than the national average. A 2014 report released by the state warned that there are not enough skilled young workers, particularly in the engineering and computer science fields, to replace the aging workforce. The same approach may not work in every part of the state. Families in rural areas may experience different challenges than those in Atlanta. Children living in more remote parts of the state might be further from libraries, for instance, so partnering with churches or other community organizations to increase access to books might be necessary. Swann, who was careful to note that she and her colleagues did not have a contract to do any work for the campaign and were simply offering their thoughts, said taking a systems approach—evaluating a range of factors like affordability, accessibility, and availability—is something that could be scalable for other states. Right now, attempts to raise reading scores are often reading-focused, which makes sense on the surface, but ignores real issues including absences due to poor health, or school suspensions because of zero-tolerance policies. So Weldon traveled the state looking at access issues in different areas, and worked with the health commissioner’s office and other officials to look at where healthcare might play a role. In one county in southwest Georgia experiencing a disproportionate number of discipline issues (a topic the state has recently come under fire for mishandling), the state’s education department partnered with churches and other groups to work with kids on reading. As more kids learned to read, discipline issues dropped. Another contributor to low reading proficiency is access to meals. So Georgia’s libraries began serving summer meals to poor children in the last several years. They came for the food, but it also gave them easy access to books. The campaign also works with partners in the education and health fields to promote Talk With Me Baby, the only statewide initiative of its kind aimed at ending the word gap between upper- and lower-income toddlers. The challenge is persistent. The state originally said it wanted to increase third-grade proficiency to 60 percent by 2015. That clearly hasn’t happened. But Weldon believes improvement is possible. “The ingredients are there” to be successful, Weldon said, it just requires putting all the pieces together. Sandy Chavarria doesn’t want her son to be just another statistic. Each night, she does something that would have seemed foreign to her as a kid. She tucks him into her arms and reads. 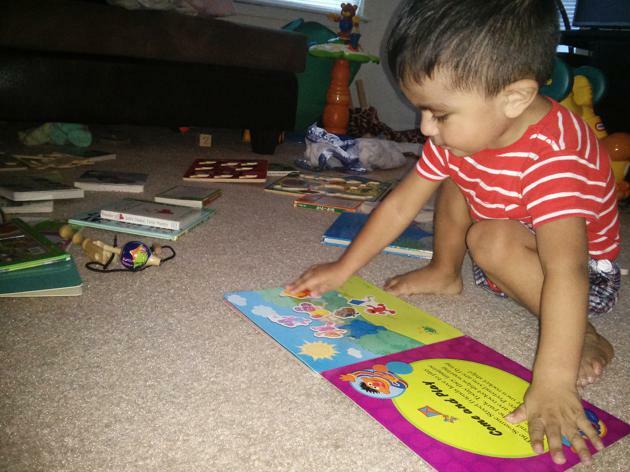 At nearly 2 years old, Yahir cares less about the words and more about the fuzzy book covers and pop-up characters—a current favorite has a soft circle he can touch while mom reads about spots. Next, it might be truck books, or stories about bugs, then maybe choose-your-own ending chapter books. Chavarria is open to all of it. “I want to lower his chances of being behind,” the 23-year-old said. Chavarria, who recently started a job at a nonprofit focused on preventing the sexual abuse of children, said she has worked hard to overcome stereotypes of Latinos as teen parents who don’t go to college, graduating from school despite being a relatively young mom from an immigrant family that was trying to eke out a living during her formative years. 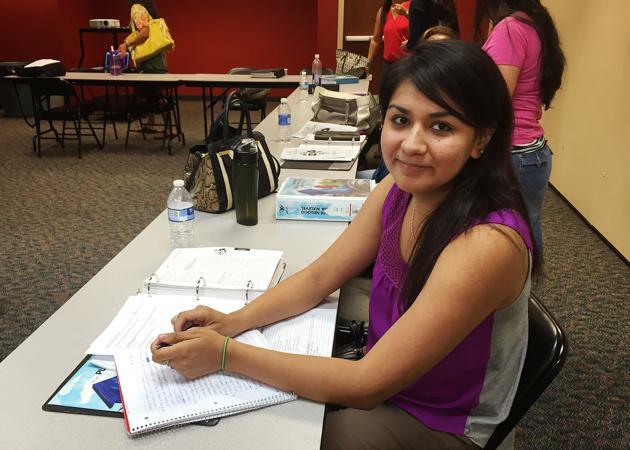 “I’ve been translating since I was 8,” she recalled during an interview at a local nonprofit where she was taking a free business class. Her parents had access to education only through elementary school in Mexico. English was a struggle. Reading to children wasn’t part of how she was raised. For Yahir, it will be the standard. Every few weeks, Chavarria takes him to the library to pick out books with the hope that when he gets to school, he’ll be reading. If Yahir is reading proficiently by third grade, current scores suggest he’ll be one of just a third of Georgia’s students who are reading on grade level at that time, the critical year when children transition from “learning to read” to “reading to learn,” meaning they use reading as a tool to comprehend lessons. Those who don’t make that transition--disproportionately low-income children of color—are left behind and rarely catch up. Children who struggle to read in elementary school are more likely to have discipline issues, more likely to drop out of high school, and less likely to go to college. The opportunity is huge. If the campaign works, kids like Yahir will not only be reading, they’ll be on a path toward a more prosperous, productive adulthood.